Baez strikes what should become a familiar pose. The Chicago Cubs’ Javier Baez was not having the best of Major League debuts against the Colorado Rockies Tuesday night. He had struck out three times and was hitless in five at-bats when he came to the bat against left-hander Boone Logan to start the 12th inning of a 5-5 game. 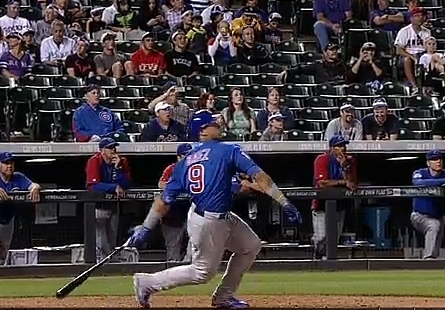 One pitch later, Baez’ and the Cubs’ fortunes had turned. The rookie second baseman launched a deep drive (414 feet) to right field for his first Major League home run. Welcome to the bigs, Mr. Baez.